I have always wanted to go to Machu Picchu. Much like the Taj Mahal in India or the Great Wall of China, it’s one of the world’s wonders that is on everyone’s bucket list. I assumed, however, that the only way to access this 15th century Inca citadel was on foot, via the well-trodden Inca trail. This gruelling 4-day camping trip was an adventure I had mentally shelved for when my children were older (they are now 7 & 6 years). It was therefore something of a revelation when I discovered you could get transport right up to the entrance gate! 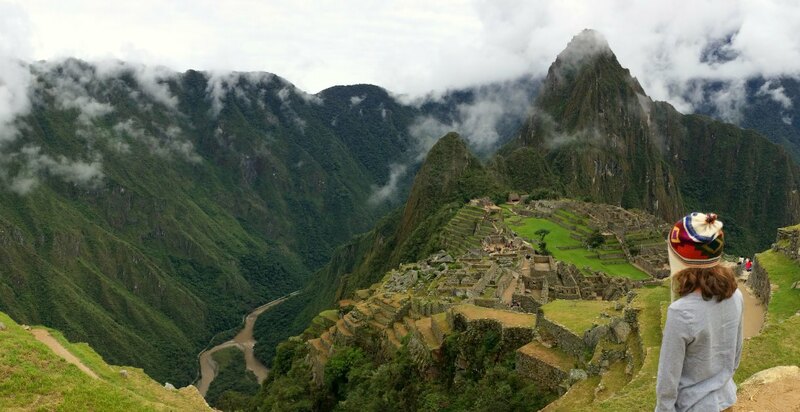 If you’d like to know how we booked our trip to Machu Picchu, take a look at this post. If you’d prefer an agent to book it all for you, take a look at this post (I partner with an excellent agent who has booked numerous family holidays in Peru for my readers). At the same time that I realised walking was not the only way to access Machu Picchu, the Paddington Bear film was released. Based on Michael Bond’s classic children books about a lovable bear from ‘deepest darkest Peru’, this far-flung South American country leapt to the top spot on my children’s bucket list too. What I hadn’t appreciated until we arrived in Peru, however, was just how much else there is to see and do besides visiting the magical lost city. Nor had I expected the actual journey to Machu Picchu to be so interesting, so spellbinding or quite so beautiful. We flew into Peru’s main international airport, Lima. A lot of traditional Peruvian itineraries bypass this coastal capital but we decided to take it easy with the kids in tow and spent a full day here. It’s not the prettiest of cities – rather grey and foggy with a strong smell of seaweed. But there’s more than enough to do for a day; we ate a lot of extremely good ceviche, went shopping for sombreros, watched surfers and visited Mario Testino’s Museo MATE (the world acclaimed photographer is originally from Lima). From Lima we took an early domestic flight to Cusco (we were told that it’s best to book a morning flight as there is a greater probability of later flights being delayed or cancelled due to weather conditions). The ancient Andean capital of Cusco is where most classic itineraries start but at an altitude of 3,400m (11,150ft) it’s very high and altitude sickness is a real possibility. When planning this holiday I had read that the best place to start the trip is in the Sacred Valley, which is only 1 – 1.5 hours away from Cusco but significantly lower at 2,792m (9,160 ft). So we grabbed a taxi and headed straight there. This proved to be an excellent tip. The Sacred Valley sits between Cusco and Machu Picchu and stretches some 60 miles (100km) from Pisac in the east through to Machu Picchu in the west. Carved out by the Urubamba River, this valley was the heart of the Incan Empire and, owing to its fertile land, was a major agricultural source for the Incas. It continues to serve as something of a breadbasket for Cusco today. We spent three glorious nights in the small town of Urubamba (meaning “flat land of spiders”). Located in the middle of the Sacred Valley, we found it to be the perfect location for exploring the region and its many sights. See 10 great things to do with kids in the Sacred Valley. The landscape is dramatic and regardless of whether or not you are a spiritual person, you will surely feel the magic here (usually more so after a Pisco Sour or two!). We visited at the tail end of the rainy season (during the last week of March, first week of April) when the mountains were blanketed in lush green foliage. The weather was spring-like and the skies could not have been a purer shade of blue. A lot of tours only dedicate a night or two here but there is so much to see and do that we felt our three nights were not enough. I could have easily spent two weeks here alone. While here, we stayed at the Sol y Luna Hotel, which was heavenly. Tip! We were told that you shouldn’t do anything on your first day in order to acclimatise to the altitude. The number one rule is to rest, avoid alcohol and don’t over indulge on the wonderful Peruvian food. As hard as it is to follow these rules with young kids in tow, it can really make or break your holiday. We stuck to these three tips and felt fine the following day and for the rest of our trip. During our time in the Sacred Valley we visited lots of Incan sites. They are all unique and all equally impressive but there were a couple that stood out for my kids. For my son it was Moray, which consisted of several, huge terraced circular depressions (similar to crop circles) – the largest is approximately 30m (98ft) deep. Another favourite were the dazzling white salt flats of Maras – evaporation ponds that have been in use since the Inca times. The wonderful thing with Incan sites is that they are all fun for children to explore. Some like Pisac have tunnels or big boulders and others like Chincheros boast massive stone walls seemingly built by giants. The one thing they seem to share, however, is that they all enjoy spectacular views. My son plugged himself into an audio book and was taken off to the world of Harry Potter, most likely to the Hogwarts Express. Aguas Calientes is the last stop on the route to Machu Picchu. It’s one of those towns that has developed purely because of its position near to Peru’s greatest tourist attraction. In other words, you would only come here if you were visiting Machu Picchu. We stayed the night here in Tierra Viva Machu Picchu so that we could get up early and beat the crowds. It’s possible to visit on a day trip from Ollantaytambo but we wanted to be first through the gates the next morning. As it was, we left the hotel at 8.30am! Given how quickly we move in the mornings (i.e. not very) we were pretty pleased with ourselves although we definitely did not make it to Machu Picchu for the sunrise. From the hotel it’s over an hour’s steep climb to the entrance for Machu Picchu or a 25-minute ride in shuttle bus. We opted for the latter! And then we were there. What can I say about this site that hasn’t already been said? At 2,430m (8,000 ft), this iconic city in the clouds was, in every sense of the word, simply breathtaking. It’s one of those places that you have seen so many pictures of – on postcards, travel brochures, chocolate boxes – but, as with so many wonders of the world, nothing can quite prepare you for being there in person. No one knows really why or how Machu Picchu was built. As the Incas had no writing system they left behind no records or histories or stories and so the true purpose of Machu Picchu will never really be known. It was constructed at the height of the Incan Empire in 1450 but abandoned just over a century later in 1572 after the Spaniards arrived in Peru. Incredibly, it was only discovered in 1911 when Hiram Bingham, an explorer and professor of South American history from Yale University, happened to come upon it. What a day that must have been for him, imagine! We spent just over three hours here. We could have spent longer but the kids were getting hungry and tired (tip! remember to bring plenty of water and snacks!). Nevertheless we saw a lot in the time we were there and enjoyed exploring on our own. We decided not to take a guide (in general we don’t find guided tours particularly kid-friendly) and ended up following the llamas around instead – much to the children’s delight! It’s worth noting that the number of visitors is restricted to 2500* so you must book your tickets in advance. Similarly, after 10am it gets very busy so it’s definitely worth trying to get there as early as possible – unlike us! In Cusco we spent two nights in Tierra Viva Cusco Saphi and one night in The Garden House. It’s so hard to choose the best part or even best parts, as every sight, every meal and every experience was a highlight for us! The circular terraces at Moray had my son spellbound and both children loved hugging the alpacas and llamas! One of the best things about Peru for me, however, was the journey itself to Machu Picchu. I had only ever really thought about this mysterious mountaintop city when planning our trip but once I was there I discovered that the country has much, much more to offer. Plus the driving distances and travel times between places were not long – a huge bonus point for families! And let’s not forget the food! Peak season is May to October (the dry season or ‘winter’ in the Southern Hemisphere), with the greatest number of visitors in July and August. During this season the days are usually clear and sunny with chilly nights, especially at high altitudes. We went in Spring Break at the tail end of rainy season and it turned out to be a wonderful time to visit, as everything was so green. Plus there were fewer crowds and the hotel rates were not high peak. The rainy season runs from November through to March (January and February are traditionally the wettest months). This period sees dramatic price drops and fewer visitors but flooding and landslides are common. My son loved the Muña tea! 1. Do not rush! Not only do you need to give yourself time to acclimatise, you really need to allow time to enjoy places. I would highly recommend spending at least three nights in the Sacred Valley, this is one place you should not miss. 2. Spend a night in Aguas Calientes so that you can get up to Machu Picchu early before the crowds do. Click on the icon with the three horizontal lines (in the top left-hand corner of the screen below) to view our video series on Family Travel in Peru. We work with an excellent partner agent in the UK who specialises in family travel and who has organised many family holidays for our readers in Peru. If you would like to receive a quote, please fill out the enquiry form on our Contact Page (your enquiry will be sent directly to our partner agent). Note that we do receive a small commission for any holidays successfully booked but this does not affect your quote in any way. You never pay more making an enquiry through Far-Flung Lands than by booking directly with any of our partner agents. To view all our blog posts and videos in the Peru With Kids series see our destination guide to Peru for Families. This peru series of posts has been a life saver for me! We are planning an 8 day peru trip in mod april woth our three kids 6,9,11. One question what did you do with your luggage when you were at Machu Picchu? We wanted to do the same thing leave from the sacred Valley / Aguascalientes and then go straight to Cusco from Machu Picchu. Hi Nicole, Apologies for my delayed response (as you’ll see I’ve moved the Peru series to a new website but the posts remain exactly the same). I’m very happy to hear they’ve been helpful. We left our bags in the hotel (https://farflunglands.com/peru-kids-machu-picchu-tierra-viva/) which we had stayed in the night before visiting Machu Picchu. We then visited the site in the morning, picked up our bags around lunch time and took the afternoon train back to Cusco. Hope you have a wonderful trip! Excellent post! Very informative….I planned on taking my children this week but plans changed and I may take them next year. I am going for work and will stay a few days and visit Machu Picchu. Given that I am going solo I may end up using tour company for safety reasons. What are your thoughts? Hi Kim, It all depends on how comfortable you are travelling really. The benefits of booking through a company are that all your travel is taken care of, someone is on hand to deal with any unexpected incidents (such as cancelled or delayed flights) and you don’t have to worry about anything. Most people visiting Peru have trouble-free trips so it really depends on how you feel. I hope that helps? Thanks! We booked our trip to Peru for November 18-25 with our two kids, ages 4 and 1, but now I am getting very nervous as so many friends are telling us not to go there with young kids due to the altitude. I’m contemplating cancelling my trip, although I’ve already paid for everything and most is non-refundable. We reserved two days to see Machu Picchu. Should we do a tour, or do it on our own? Let me know what you recommend we should do. We are staying three days in Cusco, then booked two nights in Aquas Caliendes. Hi, firstly I believe you will have an amazing time in Peru! Yes, altitude is an issue but if you plan your trip correctly and take it easy then it is manageable. My recommendation is to start your journey in the Sacred Valley. At 2,792m (9,160 ft), the Sacred Valley is significantly lower than Cusco which sits at 3,400m (11,150ft). If you can start your journey in the Sacred Valley then this will give everyone time to acclimatise at a lower altitude. We spent one day at Machu Picchu and although it was a long day, it was enough for the kids. We didn’t do a tour and this gave our kids the freedom to wander and explore. I would definitely recommend bringing a kiddy backpack / carrier for your youngest child as Machu Picchu involves a lot of walking. I hope this helps! I think that if you can ease yourself into the holiday with some downtime in the Sacred Valley you should be fine. We just completed our journey to Machu Picchu and I cannot thank you enough for all of your help with every detail from how to get the bus tickets, Machu Picchu tickets, hotel, etc. We actually went up there twice and it was much easier than I expected. The kids did great and we got some spectacular photos. I’m so glad we didn’t cancel our trip. From the bottom of our heart, THANK YOU!!!! Many thanks for this very informative blog! We are planning a trip to Peru with our 4 y/o and will be following your itinerary. By the way, could you please tell me where you took this picture from? I want to get a portrait shot of ours similar to this. Thanks for sharing your experience and providing helpful tips. We have been planning a trip to Machu Picchu sometime towards the end of August with our 17 month old son. Do you think it will be too much for him dealing with the high altitudes of Machu Picchu. He has been traveling with us since he was 3 months old, have already been on long flights from West Coast to India (about 25 hours journey) and to long road trips (about 14 hours) and has coped well so far. He will be traveling with us to Argentina as well just before the Machu Picchu trip. We have about 4 days to spend in Peru. And we would love to see both Sacred Valley and Cusco but dont want to over do it with the little one. Do you have any recommendations on which town to choose given that we will be there for 4 days only? Thanks for the posts and pictures. We are considering taking our daughter next summer, when she will be 10. I’ve been considering doing a guided tour, but after reading your post, I think we can do it on our own. Hey, if you haven’t been to New Zealand with your kids, add that to your list. We did that over Christmas for two weeks and it was amazing! We agree, New Zealand is amazing! I went when my eldest was just 18-months old and would love to go back with the whole family. Enjoy your trip to Peru! Great post! My husband and I are planning to start traveling around the world with our kids, starting in South America, next year with our younger children. I’ve read many mixed reviews about the safety of the different countries in South America. Did your family at all feel like Peru wasn’t very safe? We will not be staying at any resorts, just what we can find on airbnb, but I wanted to know any tips you might have on safety, first hand or if you ever felt unsafe or if there were places to avoid? Thanks! Hi Tara. Thanks for your lovely comment, and apologies for my delayed response. In terms of safety, I should start off by saying that I am by no means an expert in this area, but at no point did I feel unsafe in Peru. The circuit we followed is of course well-trodden by tourists, and providing you don’t stray too far from this path, I don’t see any reason to believe it is unsafe. Like most places around the world, you still have to watch your pockets in crowded places, avoid dark, empty streets at night and stick to official taxis etc. I believe that flooding can become an issue during the rainy season and something to take on board if you are visiting during these months. It’s also worth checking your government’s foreign travel advisory service during the planning stages of your trip and again before you leave. e.g. https://www.gov.uk/foreign-travel-advice/peru I hope this helps. Have a great time! Wow such an awesome trip and so many great words of advice. Love the pictures. Thanks for sharing. Absolutely loved your website and the beautiful pictures ! Thank you for the detailed itinerary and info on how to plan and book. I am hoping to follow your same itinerary. We plan to travel with our 2 girls ages 11 & 9 in December during winter break from Washington DC. Hoping that the weather co-operates and its a memorable trip. Thank you so much! We hope that you have the most amazing time. If you have any questions, please do get in touch info@farflunglands.com. Great! We’ve just booked our trip for the same time of year in 2017. How did you get around to the sites around Urumbamba? We used a taxi. You can find the details in this post: https://farflunglands.com/plan-book-budget-family-holiday-machu-picchu-peru/ Hope that helps. So glad I found your site! We leave for Peru with our 2 children (13 & 11) in one week! Reading your posts and watching the videos is getting me so excited! I will be showing these to the kids before we go. Thanks for sharing! Thank you so much Heather for your lovely comment and I hope you’re having a wonderful time! We’d love to hear how you got on and do let us know if you have any tips to add to this post. Enjoy! Awesome post! My husband and I are currently planning a trip to Peru for next year in May. Our son will be 2 years old by that time. Do you think it would be fine to take him on the trip? He has been traveling with us since he was 7 months old. Thank you for posting this! Hi Jossie, apologies for my late response. When we were there we saw a handful of children around that age. I think so long as you are prepared to carry him around the Inca sites on your back, and have the stamina to do so (there are a lot of steps! ), you’ll be fine. I would also factor in plenty of rest time into your itinerary. Brilliantly written, always has been on our list. We sail and we got 3 kids, 4, 6 and nearly 10. Looks like we can do it. At the moment in San Andre islands, Colombia . Wow! Are you on an epic family sailing adventure? Are you planning on sailing to Lima? Where do you go after the San Andre Islands? Do you have a blog? Too many questions!! I’d love to follow your adventures! Let me know if you sail through the Panama Canal and I can wave to you! Loved this! Very helpful. I have a question though–if you only have one day and had to choose between a city tour of Cuzco and the Sacred Valley–which would you choose? It has to be a quick trip–so I have to make a choice! Dang it! Hi Sandra. That’s a tricky question! As all the sites in the Sacred Valley are spread out in all directions, you would probably spend a lot of time in the car. We also limited ourselves to one or two sites per day so as not to overdo it (in the high altitude). I’m assuming you’ll be flying in / out of Cusco, in which case it may make sense to stay put there. Although I wouldn’t necessarily recommend a full tour on your first day either as I know of people who did just that and ended up with altitude sickness. If, though, you are mindful of taking it slowly, e.g. take transport instead of walking, eat lightly, avoid alcohol, then you may be fine. It’s so hard to tell as everyone reacts differently to the altitude. If you opt for the Sacred Valley, be aware that the altitude in a few of the sites can be just as high as Cusco (there is an altitude chart on this post https://farflunglands.com/10-things-to-do-with-kids-in-the-sacred-valley-peru/). The upside is that you can rest in the car between the sites. In short, your question is too hard to answer! Both are equally worth seeing. Sorry, not sure I’ve been very helpful! I loved this post! We are currently planning our own family trip to the Machu Picchu area. We are trying to decide if we can plan it ourselves, or if we need a tour. I notice that in your response to Martin, you were planning to post how to book the trip. I would love to see that information and learn from your booking experience! Hi Victoria…this is JUST the page I need. We ARE traveling to Peru and Machu Picchu with our 6 year-old girl in just 2 months time…I’m sorting details NOW and was seeking guidance. I’m a world-traveled (4 years) former backpacker (in 20’s, now 50) now making this journey with well- traveled wife and kiddo. Starting in Lima (for a conference), and am now sketching the rest of the trip – primarily focused on the SAME things/places you guys did. The middle-ager in me makes me curious about tours…who did you go with/recommendations? It certainly seems like you were un-rushed with it all, did the tour company arrange all your accommodation (as you wonderfully describe) and travel (train, etc.) details? I’m considering options that lessen the “moving parts” of organizing such a trip, while ensuring time/access to the wonders. LOVE your observation about “being there” post seeing all those postcards… I too have experienced that; Giza, Taj, Teotihuacan, Chichen Itza – the absence of breath deepens the beauty. Now years later I’m fortunate to visit Maccu Picchu. This is incredible! thank you for inspiring me. What a great experience! I will definitely come back to this post the day I’ll be planning a trip to Peru. Thank you for all the great tips! Thank you! We hope that you make it there soon! This was such a helpful post and one I’m definitely bookmarking. We’re hoping to do Machu Picchu later this year or next and your beautiful photos are such an inspiration. My kids are a bit older than yours so it’s great to know that it is doable and there are plenty of things for kids to do beyond the ruins. We’d love to add Sacred Valley too! Thanks so much Mary. We have a few more posts and videos in the pipeline detailing some of the main sights and destinations on this trip so hope these help too with the planning. Amazing post, really! Love the photos! My boyfriend keeps talking about how our next proper travel destination should be Peru and I’m absolutely convinced after reading this post! So, like you, Machu Pichu had been parked for much later, when my kids are older but this has inspired me so much! My kids are 6 & 4 (at least 7 & 5 by the time of travel!) Would this be ok? Thanks so much! As my children were 7 and 6 at the time of travel and loved it, I’d say that 7 & 5 is certainly doable. The tricky age is when they can’t walk very far and are too heavy to carry (and there were a few moments when my 6 year old wanted to hitch a ride on his dad’s shoulders!) Obviously every child is different though and what works well for one family doesn’t necessarily work well for everyone. My number one tip would be to opt for a slow paced itinerary. I was very tempted to tag on Lake Titicaca (which many tours do) but relieved we didn’t as it would have been too much for the children in the time we had. As it was we got to really enjoy each destination. Wow! Just beautiful. Machu Picchu has been on my bucket list forever and I haven’t been able to visit yet. Now that I have kids it will be a trip with them so thanks so much for these fantastic tips. Thanks so much Cheryl. Likewise it had been on my bucket list for forever too and I just assumed it wasn’t doable with children. But how wrong I was! Wow. I loved your photos and almost felt as though I was there with you. What an incredible experience. My husband and I have a goal to finish seeing all 50 states (we’ll do that this year- minus Hawaii) and then we’re venturing out to explore more international destinations. Machu Picchu is definitely one of the destinations I’d love to see. What a goal to have! Love it! How many of the 50 states have you been to so far? I can’t believe this place is real! All of your pictures are phenomenal!! Thanks for all the practical tips like being careful with the altitude! Certainly good information to have. Thank you so much! Appreciate the pin! Thank you for the tip on acclimatization, though I don’t know whether we’ll ever go to Peru. So it’s possible that my only “trip” there will be through your photos, and what gorgeous photos they are! Thank you for sharing with your readers the memories of this wonderful trip! Thank you for your lovely comment! Likewise have just been enjoying you post on Lacock – what a pretty village! Awesome pics and useful info. Such a cool way for your kids to experience world history first hand. Amazing write-up & I’m looking forward to reading more! Love all the thought and attention to detail you gave to planning the trip & making sure that your kids were comfortable. You can tell by the photos (and video!) that they were so happy & awe-inspired by the whole journey. Would love to take our kids to Peru someday & I’m saving this for reference! Thank you so much Kate for your lovely comment. I have to admit I am a bit of a control freak when it comes to planning a trip and do spend an unhealthy amount of time researching a holiday! But inevitably there is always more to discover, both on the trip and (more frustratingly!) on returning from a place too. Which of course is one of the reasons for creating globetotting. Appreciate your kind words and hope you get to go with your kids one day. Well, being a Peruvian myself and having been to Machu Pichu, I think 5 times (my husband is Argentine and he´s been over 30 times….he was a tourguide)….every single times, it´s breathtaking and wonderful and amazing and beautiful. Friends of ours who used to live in Aguas Calientes (at Rupa Wasi hotel and the TreeHouse Restaurant) would go up to Machu Pichu on the full moon, up some steep hidden stairs. Now THAT was increible. I´m glad your kids liked Cusco, my daugher spent the first four years of her life there and I hope it stuck in her memory as a good thing. I really want to visit Peru. I want to do the hike to Machu Picchu also want to do a flyover of the Lines. This makes me want to plan my trip to Peru right now. Very happy to hear that! I expect the Inca trail must be one of the most rewarding hikes in this world. Hope you get there. Send us a postcard when you do! What beautiful pictures and Machu Picchu looks like an amazing place to take kids! Thank you Sophie! I was actually surprised by how much the children enjoyed it. Turns out the Incas built some of the world’s best playgrounds! Looks like you guys had fun. Peru is one of my fave destinations. It’s become one of my favourite destinations too. I’m already itching to return! Thanks for your comment. Loved your pictures! I’m going to Peru soon and have my own journey to to Machu Picchu planned – can’t wait! Thank you Jen! What route are you taking? Hope you have a fantastic time! Wow, could your photos be more beautiful? I am probably the only person who has toured Peru and didn’t go to Macchu Picchu, but I did get terrible altitude sickness in Lake Titicaca. This looks amazing. Thanks! I think Machu Picchu deserves the hype it gets but at the same time I was surprised by how many other incredible sights there are in Peru, that don’t get anything like the same amount of media attention that Machu Picchu gets. When I initially planned the trip I really wanted to include Lake Titicaca as well but was worried the itinerary would be too intense for the kids. It does at least give me an excuse to return! 🙂 I’m sorry to hear you got sick though. If you were to revisit Lake Titicaca again, would you do anything differently? Would be very interested in any tips you have on this as it is a concern, especially when travelling with kids. This is a great post!! Reuben is begging to go to Darkest Peru because of the Paddington movie. I’d love to take him. Do you think it would be doable with a 5 year old and a 1.5 year old? What would be the minimum amount of time you’d go for? Thanks so much! My son is 6 and loved it so I’d say it is certainly doable with a 5 year old and I’d go soon whilst your 1.5 year old is still light enough to carry around in a backpack (Naturally, this is not pushchair territory!) I found our itinerary was perfect for 8 days, but if you can stretch to 12+ days you could tag on Lake Titicaca (and more!) although the travelling distances would be greater. What I liked about this itinerary is that there were no long road trips. More details on each location (Lima, Sacred Valley, Machu Picchu & Cusco) will follow soon! Wow, wow, wow. What a great blog. I was totally captured and now totally want to go to Peru! Thank you so much Antonia!! You’d love Peru, it has everything – incredible scenery, culture, history, food and cute fluffy animals 🙂 I want to go back to see Lake Titicaca which we didn’t have time for on this trip. Thank you! I was really surprised by how doable it was with children. There are of course still a lot of steps in Machu Picchu itself (and many of the Inca ruins), but its amazing what a few mental games can do to keep them going. In Ollantaytambo for example (which had 300+ steps) I told them I’d send a photo of them at the top to their school teachers, and they practically flew to the top!